Help Luke and C-3PO track down Jedi legend Ben Kenobi in his fast landspeeder. Open the trunk, grab the binoculars and scan the hori zon—but watch out for the dangerous Tusken Raider and hungry womp rat! This comes down to 15.51 cent per brick. The Luke's Landspeeder™ (75173) Lego set is available from the sites below. However, they do not offer delivery to your selected region. 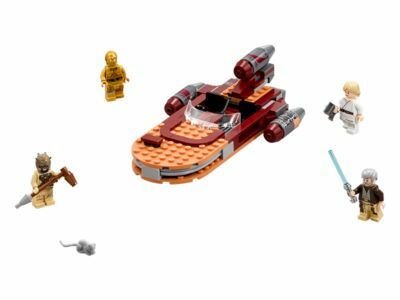 The Luke's Landspeeder™ (75173) Lego set is no longer directly available from the sites below. However, 3rd party partners of these sites might still have the set available. Alternate description Go in search of Ben Kenobi in Luke’s Landspeeder!